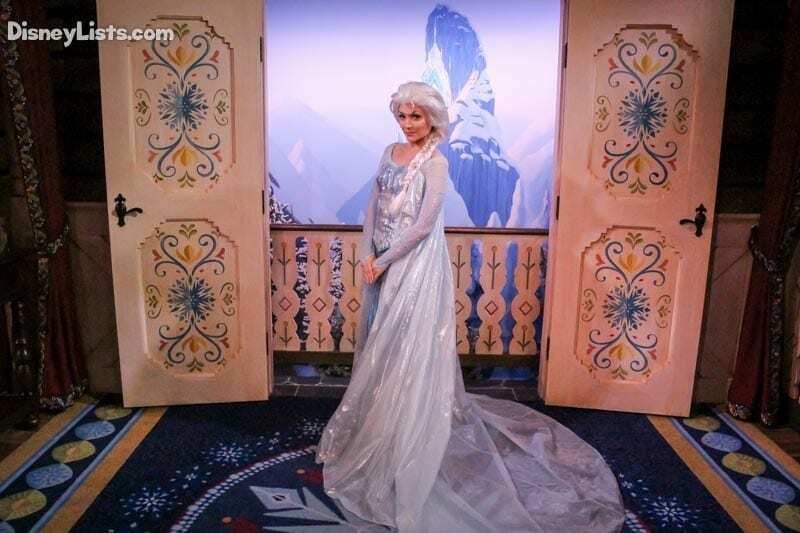 While we think everyone that steps foot on Disney property is magically transformed into a Princess or Prince, Disney does have “official” Princesses that make our hearts flutter! From Princess Snow White that first showed on film in 1937 to Princess Moana’s film debut in 2016, Disney Princesses are absolutely timeless and memorable. 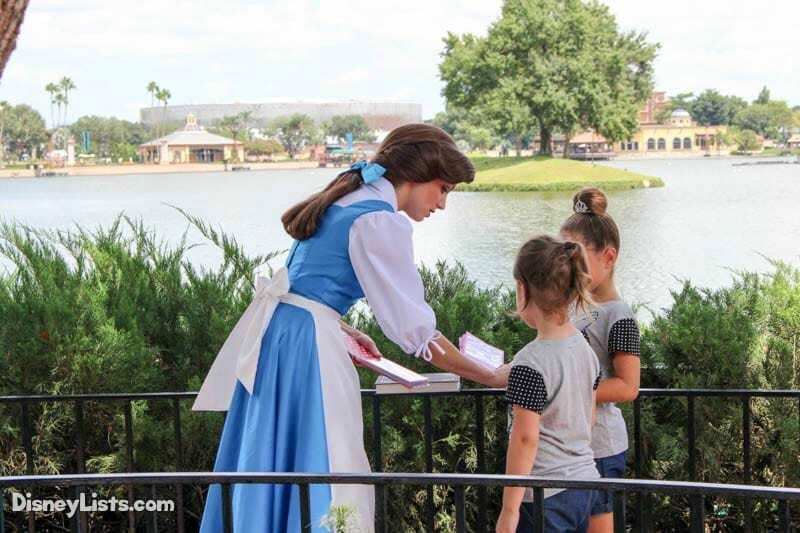 It’s no wonder Princess Meet and Greets are extremely popular! Check out the checklist below of 14 Disney Princesses (in alphabetical order) and where you can meet them. Please keep in mind that Princess Meet and Greets are subject to change! Be sure to check your My Disney Experience App and/or Times Guide to ensure the Princess is at the location stated below. Character dining mentioned below is subject to change. Our recommendation is to never make a dining reservation to see just one particular Princess, as you never know if they decided to get some beauty sleep instead! Costume: Anna is in her black and blue dress with pink “cape”. Elsa is wearing her gorgeous sparkly blue dress. Typically Joined by: Just the sweet Arendelle sisters here! Extras: Line can be lengthy with no FastPass available. Plan to arrive early if possible. You can also see (but not meet) these popular sisters at Hollywood Studios’ For the First Time in Forever: A Frozen Sing-Along Celebration as well as Magic Kingdom’s Festival of Fantasy Parade and Mickey’s Royal Friendship Faire. Four Meet & Greets available. Costume: Ariel is in her Mermaid form here! Dining/FastPass+: No dining required. FastPass is available. Extras: This is a FastPass you may be able to snag later in the day. Don’t forget to enjoy all the details of Ariel’s Grotto… and maybe ask her about her dinglehopper (aka fork)! You can also see (but not meet) Mermaid Ariel in Magic Kingdom’s Festival of Fantasy Parade. Costume: Ariel is in human form in her beautiful light blue dress. Extras: Make dining reservations 180-days in advance for the best chance of dining here. Costume: Aurora is in her pretty pink dress. Extras: Look for Aurora in the France Fragrance Gardens. 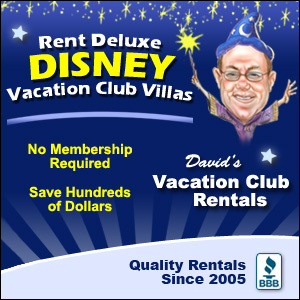 Dining/FastPass+: Dining and advanced reservation required. 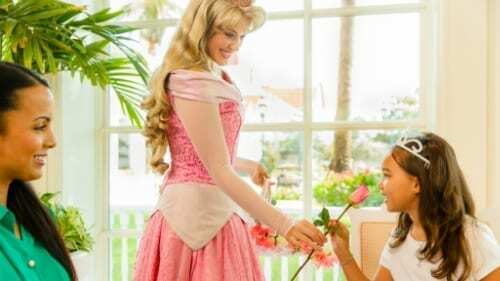 Typically Joined by: Rose Petal – a magical rose petal from Aurora’s garden that has turned into a princess! Princess Aurora usually makes a brief visit but does not stay for the entire tea party. Extras: Make tea reservations 180-days in advance. Reservations are required. Keep in mind, Rose Petal is the star of this tea party! Costume: Belle is in her lovely yellow ballroom gown. Times: Schedule changes but usually 9am – 9pm. Extras: More than just a Meet and Greet! This experience is really an attraction where you get to interact with Belle and retell the story of how she and the Beast fell in love. You can also see (but not meet) Belle with her Beast in Magic Kingdom’s Festival of Fantasy Parade and Hollywood Studios’ Beauty and the Beast – Live on Stage. Costume: Belle is in her simple blue dress with white apron. Extras: This location makes for great photos with as she stands at the water’s edge. Costume: Cinderella is in her stunning blue ballgown. Dining/FastPass+: No dining required. FastPass available. Times: Schedule changes but usually 9am – 9:30pm. Extras: Meet two Princesses with one FastPass! 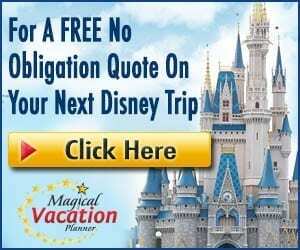 This is a great place to see the most classic of Princesses (Cinderella) and one of the newest additions (Elena) in one swoop! You can also see (but not meet) Cinderella with Prince Charming in the Festival of Fantasy Parade. One Meet & Greet available. Costume: Elena of Avalor is in her vibrant red with pops of floral dress. Extras: Meet two Princesses with one FastPass! 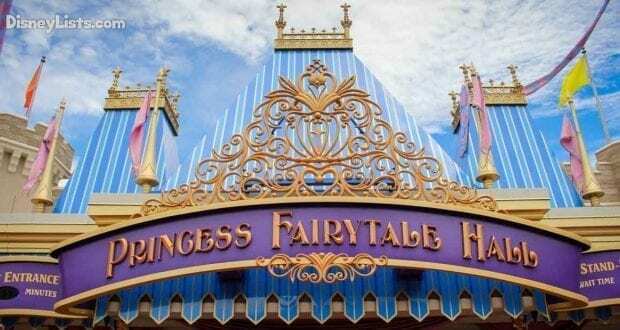 This is a great place to see the newest Princess addition, Elena, and the classic Princess Cinderella in one swoop. Three Meet & Greets available. Costume: Jasmine is in her full blue attire with gold accents. Extras: The lines here typically aren’t too long. Explore the Morocco Pavilion’s beauty and you’ll find this quiet character spot tucked away near Restaurant Marrakesh. Environment: Outdoor but under cover. Extras: The line does get lengthy so try to catch this sweet couple early in Adventureland near The Magic Carpets of Aladdin attraction. Costume: Merida is in her royal blue dress with beautiful flowing red hair. Environment: Outdoor but partially under cover. Extras: The line does get lengthy so try to catch the brave Merida early. Try using the bow and arrow while you wait! You can also see (but not meet) Merida in Magic Kingdom’s Festival of Fantasy Parade. Costume: Moana is in her tan skirt with reddish, orange wrap top. Environment: Outdoor typically near Adventureland’s Jungle Cruise. Times: During special ticket event hours. Extras: If you get a chance to meet Moana, you can expect a very long line to see her as she is a special character meet and greet. We hope one day she will have her own meet and greet location – or dining experience! One Meet & Greet; Second Possible Appearance! Costume: Mulan is in her traditional Chinese gown that she wore to see the matchmaker. Extras: The line to meet Mulan is usually a long one because she is such a unique character! Extras: Be advised that Mulan is NOT a regular at Akershus! She’s one of the bonus Princesses that if she makes an appearance, you are very lucky to have seen her. We don’t recommend reservations here if Mulan is the only reason for your visit as it is a slim chance but still a possibility. Costume: Pocahontas is in her tan Indian Princess outfit as seen in the movie. Environment: Outdoor but with cover. Extras: Walk down a beautiful, nature-filled path to reach Pocahontas! Somewhat tucked away, the line to meet Pocahontas is normally rather short. Two Meet & Greets available. Extras: Meet two Princesses with one FastPass! You can also see (but not meet) Rapunzel and Flynn Rider in Magic Kingdom’s Festival of Fantasy Parade and Mickey’s Royal Friendship Faire. Costume: Rapunzel is in her purple and pink dress with her long hair beautifully braided. Costume: Snow White is in her lovely yellow and blue dress. 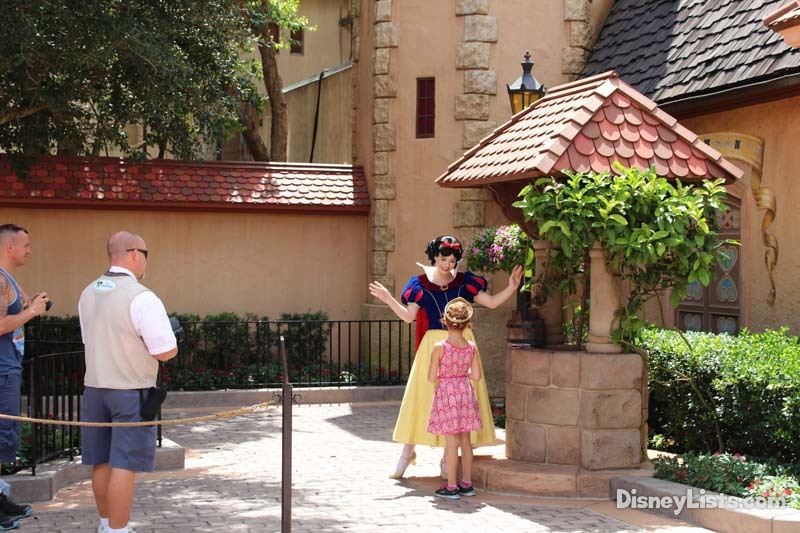 Extras: This location makes for great photos with Snow White, as she stands next to the wishing well! Costume: Tiana is stunning in her green/yellow gown. Extras: Meet two Princesses with one FastPass! You can also see (but not meet) Tiana and Prince Naveen in the Festival of Fantasy Parade and Mickey’s Royal Friendship Faire. Keep an eye out for the possible return of Princess Tiana’s Riverboat Ice Cream Party held at Liberty Belle Riverboat. We hope this party will return once the refurbishment of the Riverboat is complete! How many of these Princess Meet and Greets can you check off your list?